Are you a good cat? If so, you deserve an all natural toy too. 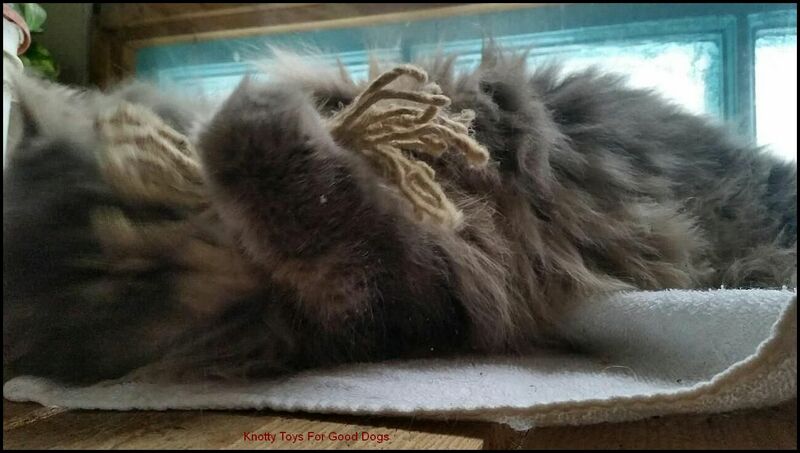 That’s why with help from my cat sister Dottie, I created the Knotty Bon Bon for Good Cats. I noticed Dottie likes to chase bugs, especially spiders. She bops them, tosses them about & usually eats them, poor things. I also noticed Dottie goes goofy over catnip. I put these two observations together & came up with a hemp rope toy specifically for good cats. It looks a bit like a bug & we take our Bon Bons & toss them with dried catnip harvested from our property. Cat’s enjoy mimicking the predatory sequence when they play – stalk, pounce, kill & eat is hardwired into all cats even though house cats don’t depend on a successful hunt to eat. Toys like laser pointers only fulfill the first two steps of the predatory sequence & can leave your good cat feeling frustrated or unfulfilled. Dottie has reported that she enjoys playing with her Knotty Bon Bons & her predatory needs are satisfied. As a bonus, the Knotty Bon Bons clean her teeth as she plays. My huMom likes this because trying to brush Dottie’s teeth is a challenge but clean teeth is very important. Are you a good cat? If so have you entered my giveaway? You could win a pack of Knotty Bon Bons!